I’ve been wanting to make soufflés for a while now and when I was at home for Christmas I finally did. With my very knowledgeable mother by my side. But I needn’t have worried – it wasn’t hard at all. And it is so satisfying watching the soufflés rise in the oven through the oven door. The original recipe called for Grand Marnier, but we didn’t have any and therefore substituted it with another liqueur; St Germain. It didn’t add that much flavour though, but there was an elderflower hint at least. Melt the butter in a saucepan. Add the flour and incorporate it into the melted butter using a wooden spoon. Add milk and sugar and incorporate it on low heat until the batter is smooth and easily comes off the sides of the pan. Leave to cool. Thereafter mix in the egg yolks, liqueur and lemon zest. Beat the egg whites to a hart foam and fold them into the mixture. Butter the ramekins thoroughly and coat them in caster sugar. Fill the ramekins (all the way up and make sure the surface is even). Bake in 200C for 12-15 minutes; until they’ve risen above the ramekin edge and are golden brown on top. Keep an eye on them through the oven door. 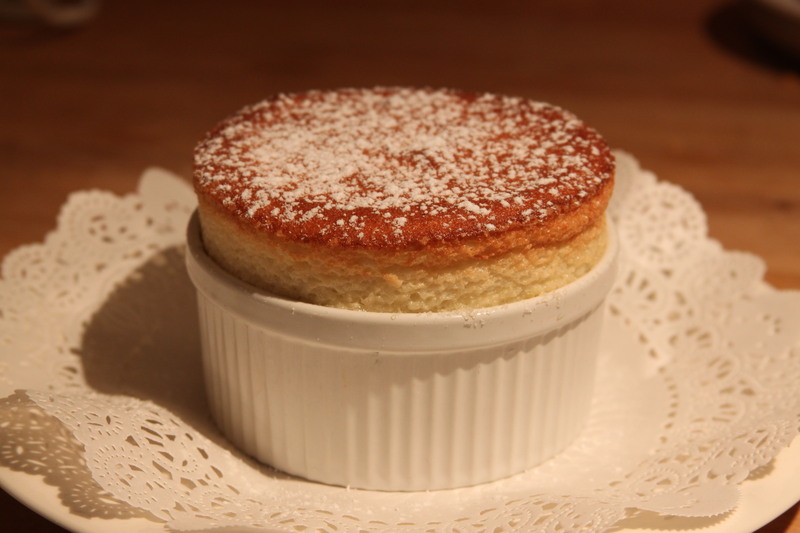 Remove the soufflés carefully from the oven, dust with icing sugar and serve immediately.